With a combined GVA of nearly £700 million, there is no doubt that the creative sector is one of Birmingham’s economic pillars. In only six years, the local creative industry has gone from employing 20,000 people to providing more than 34,000 jobs, and the number of creative businesses in the city has grown from 3,400 in 2010 to nearly 6,000 in 2016. Such a booming industry needs suitable space, which is readily available at some of the top creative workspaces listed below. The Old Print Works is located in a heritage building just a short drive away from Birmingham city centre. This is a space that markets itself as being ideal for makers, designers, creators, artists, and anyone interested in developing creative and sustainable solutions for the local community. There are 40 creative work units and studios for rent at The Old Print Works, which also include access to five different communal areas (including a lunch room, courtyard, garden), where creative professionals can mingle and network. The Old Print Works also offers affordable co-working space at The Transfer, where daily, weekly, and monthly memberships are available. With a central location in the heart of Birmingham’s Jewellery Quarter, Assay Studios is often regarded as one of the most innovative workspaces in the city. The studios are located in a Grade II building and have been recently renovated and redecorated to include a mix of new and old fixtures and fittings. The redevelopment project has been successful enough to attract high-growth creative companies like Deliveroo, Green Room Detail, Grayling, and Emerald Technologies. Facilities include a fully equipped kitchen, showers, break and meeting rooms, and bike storage. 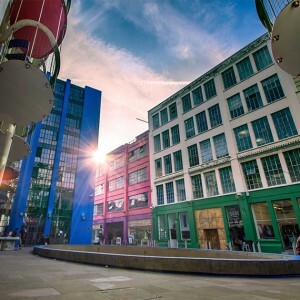 The Custard Factory is located in Digbeth and is a top choice for creative businesses looking to establish themselves in the city’s renowned Creative Quarter. The workspace offer at The Custard Factory includes small studios, office units, artist and workshop space, retail, and industrial space, all located in a beautiful Victorian building and appointed to offer the kind of space that fosters creativity and innovation. This is another centrally located workspace developed to suit the needs of creative entrepreneurs. Fazeley Studios are only a 6-minute drive from Birmingham New Street Station, offering convenient access for both tenants, visitors, and clients. The studios have been operational since 2008, when they became one of the pioneers of creative workspace in the city. Fazeley now offers boutique studio offices that can accommodate anything from 5 to 150 staff, and which feature superfast broadband, free parking, open plan space, and flexible rental terms. Current occupiers include a mix of digital and creative businesses, such as the BBC, Maverick TV, Media Dog Films, One Black Bear, Stoney Lane Records, and Tomorrow People. Impact Hub boasts a central location only half a mile away from the Bullring. This workspace defines its mission as helping provide a playground where creative professionals can make, build, dream, play, work, explore, and share their vision for a better community. The venue offers approximately 6,000 square feet of collaborative and event space, which is available on a membership basis and provides benefits like discounted meeting room hire and access to a global online community of creative entrepreneurs. For further information on office and workspace opportunities in Birmingham please click here.